Near field scanning has been used over years to identify strong near field sources, and it has been used in the hope to identify the reasons for unwanted emissions, antenna structures and coupling paths and so on. The local magnetic or electric field strength usually does not reveal which of the sources will couple to a good antenna structure or form a good antenna structure. Answering this question is then left to the experience of the EMC engineer, for example, a weak 125 MHz signal at a location where it is not expected, might be much stronger sign of a design flaw, than a strong 125 MHz signal above a clock. Or a very local and strong source may contribute much less to the far field than a weak but distributed source, like a heat sink. To move beyond the inability of identifying the reasons of EMC problems and to obtain models that can be used for numerical simulation, and for module and IC qualification enhanced scanning methods are needed. Maxwell’s equation tell us that the knowledge of the near field in magnitude and phase around a source is sufficient to either reconstruct a model of the source, that emits exactly like the source or/and to obtain the far field emissions. A core requirement in this is the knowledge of the phase of the fields. The phase is defined as the phase (difference) between a reference point, and all other field points. Mathematically, the ability to perform near field to far field transformation is not new, first methodologies have been developed in the 1950’s and a widespread application started to be possible from the 1980’s on. This methodology is typically used for antenna characterization, and has been less frequently attempted for EMI prediction. With the available phase information, the maximized FF transformation from NF data showed acceptable match. Objective in RFI prediction is to predict the coupling between noise sources, like ICs, camera modules, flex cables, etc., and wireless antennas. And the accuracy depends on how well the source models have been created. There are two types of sources; conducted sources and field coupled sources. Each type has its own advantages and disadvantage, and we believe the combination of scanned data for fields and voltage/current data from IBIS is the best modeling method. The phase information enables this combined approached possible. This way modules and ICs can be scanned, and the obtained data can be used to predict RFI coupling within systems, and it can then be used to qualify ICs and modules to reduce the chance of RFI problems later in the product design. An oscilloscope becomes quite expensive as its bandwidth is higher. 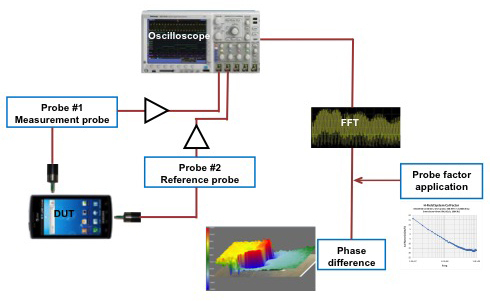 An oscilloscope can be used for any frequency range, but 4 GHz or 6 GHz is practical limit if upper frequency that the phase information can be obtained using an oscilloscope. VNA can be used for higher frequencies.